Normal navigation mode to the beginning of your route, to the depo, etc. This mode recomputes a route when avoiding. Following navigation mode to follow a loaded route exactly as planned. This mode does not recompute when deviating, it is needed to return to the route in this case. 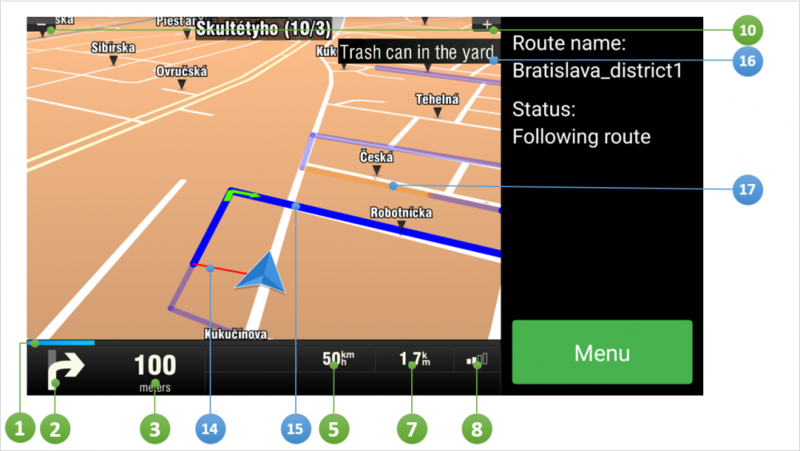 The Navigation Screen will show the map of your surrounding area with the calculated route highlighted in blue. As you approach a junction, further directions are displayed to indicate which road to take. For more information about normal navigation mode, you can check the Navigation maunal. Folllowing mode is slightly different from the normal mode. It does not have a lane assistant, speedlimit notification and it does not show a street name.